This is an extremely simple way of cooking fish. The idea is to prevent the bream from getting dry and to keep all the juices and aromas inside. If you use larger bream, you'll need to increase the cooking time: for 600g bream, bake for 35 minutes, for 1kg bream, bake for 45 minutes. You may also need to increase the salt and egg whites proportionately. Preheat the oven to 250°C/gas 9, or its highest setting. Lightly beat the egg whites to break them up, then mix in the salt. The mixture should have a damp, snowy texture. 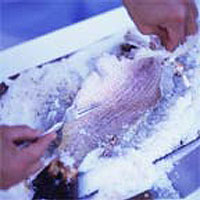 Put the bream in a large roasting tin and cover with the salt mixture. Bake for 25 minutes. Meanwhile, whisk together the sauce ingredients and season to taste with the salt and pepper. When the fish is ready, break open the salt crust. Skin the fish carefully so the salt doesn't touch the flesh. Serve with potatoes, fresh vegetables and the olive lemon sauce.